If you thought the National Cooperative Credit Union (NCCU) could not add another scholarship to its long list, think again. At a ceremony at the Dominica Public Service Union (DPSU) conference room on Valley Road on Wednesday last week, the DPSU gave away 15 scholarships in 2017. "Last year we introduced the Johnson Joseph George Thomas scholarship and this is awarded to students of members in the Castle Bruce area," said NCCU president, Josephine Dublin, the main speaker at the function. "This year we are making a further addition of one new scholarship, the Haynes Baptiste scholarship." 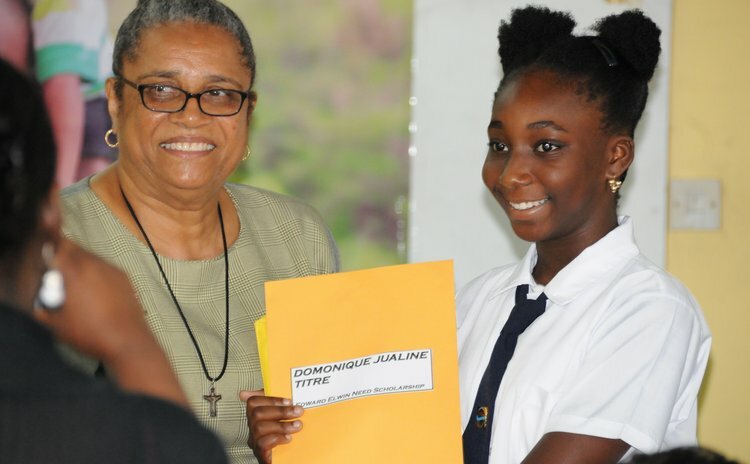 Donelle LeBlanc of Vielle Case, who attended the Vielle Case Baroness Patricia Scotland Primary School, is the first recipient of the Haynes Baptiste scholarship. Other scholarships were awarded in the names of notable credit unionists. The other scholarships were awarded to: Kerelle Joseph of Massacre who received the NCCU Merit Scholarship. Danisha Noel of Laudat, Domonique Titre of Morne Prosper, Joyce Rhianna Stuart of Pichelin, Ricki-anna Rolle of Upper Canefield East and Terrcylle Rolle of Wotten Waven received Edward Elwin scholarships. Kerra Alexis of Penville received the Ambrose Cuffy Memorial scholarship. According to Dublin the NCCU spent more than $75,000 on its scholarship programme for the 2016/2017 academic year. "We are now in our 7th year of existence and over the last six years we have spent over $400,000 under our annual scholarship programme," Dublin said. "We are glad to be in a position to make a difference in the lives of our members." She said each scholarship will cover the cost of text books and other school supplies to a maximum of $700; an annual uniform allowance of $300; the payment of school fees ranging from $50 to $525, and monthly transport allowance ranging from $50 to $80. Dublin said the credit union has invested in youth development through the scholarship scheme for more than 50 years and since the formation of the NCCU in 2010, the total number of scholarships available each year has more than doubled from 7 to 15. In her speech, Dublin told the students that their secondary education had just begun and she urged them to make the right choices. And, she warned, the NCCU would be following up, checking on performances. "Engage in wholesome activities, cast aside all distractions, nurture within you a grateful heart and remain on the path you have chosen," Dublin said. "We need to know how they are performing so that early intervention can occur if necessary." Dublin followed up on statements that NCCU Acting Chief Executive Officer (CEO) Curth Charles made in his presentation to the ceremony. "Do not let us down, do not let your family down, your country down and most of all do not let yourself down," Charles said. "Since the NCCU will provide you with all the necessary resources required to ensure that your child excels, all you will be required to do is to make sure that your child prepares for school and performs to the best of his or her ability."